A year ago, while touring and speaking in China, I landed for a day in Chengdu to meet with a young official at the U.S. Consulate and tour one of China’s rare organic farms. At breakfast in one of the city’s newest hotels I noticed a group of young American men, tall and robust in a Midwestern sort of way, and invited myself to their table. They were members of an executive team, dispatched from Caterpillar’s corporate headquarters in Peoria, Illinois to sell American-made construction and mining equipment to the first generation developers of China’s deep shale gas resources. Outside Chengdu, in Sichuan Province, said one of the men, Royal Dutch Shell is working with U.S. Energy Department technical experts to show the Chinese how to tap the shale gas reserves in an 81,000-square-mile basin. Exxon is working with provincial authorities to tap reserves in regions in central and western China. I already knew that bit of information. And I didn’t learn much more. After introducing myself as a journalist from Circle of Blue, a Michigan-based news and science organization specializing in coverage of water, food, and energy issues, the table quickly emptied. In the months since, though, new data is making it into the public realm that describes just how much natural gas — and oil — is contained in shale in China and in other nations, and just how intently the world’s developing and industrialized nations are going after it. One measure of the new riches is Caterpillar’s bottom line. Last year the company had record revenues of $60.13 billion, 41 percent higher than sales in 2010. Profits were $4.93 billion, up 83 percent from 2010. This year, the company projects its total revenue could reach $72 billion. Caterpillar’s prospects for serving the energy industry are likely to remain keen for decades. In its latest assessment, the Energy Information Administration, a research unit of the U.S. Energy Department, projects that Asia’s shale gas reserves total 39.8 trillion cubic meters, second only to the 45.7 trillion cubic meters that the EIA says are contained in North American shale reserves. 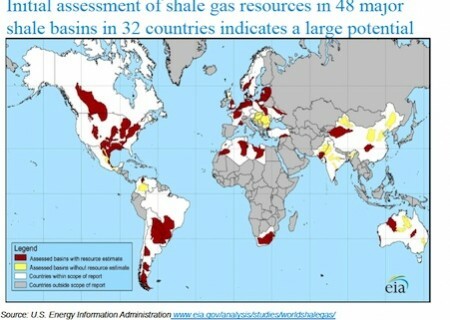 In all, the agency says, nearly 180 trillion cubic meters of recoverable shale gas reserves exist around the world, or a 60-year supply at current levels of use. In 2010, the world consumed about 3.1 trillion cubic feet of natural gas, about 20 percent of that in the U.S. Whether all of that gas can be tapped is a big issue. The biggest impediment for the time being is water. Just as in the U.S. and Canada, the centers of shale gas development, each of the wells must be hydrofracked using millions of gallons of water treated with an alphabet soup of chemicals. Moreover, much of the water used to pulverize the shale to open the gas-bearing cracks must be brought to the surface. That water is substantially contaminated and poses a serious pollution threat. In the U.S., wastewater from fracked wells is generally disposed in deepwater injection wells. In China, engineers are considering treating and recycling fracked wastewater because much of China’s shale gas reserves lie beneath the desert provinces of the north and west, where water already is scarce and confrontations for the available supply already exist between the country’s coal sector, farmers, and cities. Still, China is intent on pursuing its own “all of the above” energy strategy to fuel rapid economic growth. It’s the global leader in wind, solar, and hydro development. It’s the world leader in coal production for power and chemicals. And it is planning to more than double its natural gas production by 2035, principally from developing the country’s shale gas reserves. China also is gathering its financial might to invest in U.S. shale gas and shale oil plays, where it is learning the production practices that have produced a fossil energy boom in North America. Since 2008, and with increasing focus in recent years, China and other foreign investors have poured almost $25 billion into American shale oil and gas development, according to the Energy Information Administration. 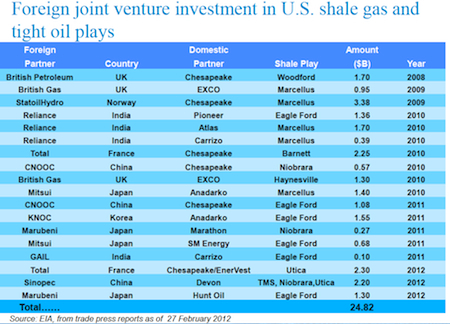 Major foreign investors in U.S. shale gas and oil development. it would be nice if the whole worlds economy just shut down. it seems like from what it looks like for the future, we will have plenty of gas but no water and it will be full of pollution from chemicals. seems like a massive recipe for disaster I think we need far more fresh clean water than we do oil and gas.